Russia has completely suspended the transit of trucks with Ukrainian registration plates through its territory, according to a posting on the website of the Russian Transport Ministry. "Due to the continuing blocking of movement of Russian freight vehicles in Ukraine’s territory, starting from 12.00 MSK February 16, 2016 Russia has completely stopped the movement of Ukrainian trucks that carry out transit cargo transportation," the posting on the ministry’s website reads. In accordance with presidential decree No. 1 dated January 1, 2016, the delivery of goods to the Republic of Kazakhstan will be continued, however, by other countries’ carriers, according to the report. Read alsoOver 300 Ukrainian trucks detained in RussiaIt is also reported that the Russian Federal Service for Supervision of Transport lifted a ban on the transit of 324 Ukrainian trucks through the territory of the Russian Federation. "These retaliatory measures will remain in place until the situation related to the blocking of Russian trucks by the Ukrainian side is settled," the Transport Ministry emphasized. Read alsoUkraine suspends Russian cargo transitIt is further reported that as of 12:00 on February 16, the movement of Russian trucks in the territory of Ukraine was still hindered. Russian trucks on their way back to Russia moving from the EU cannot enter the territory of Ukraine. 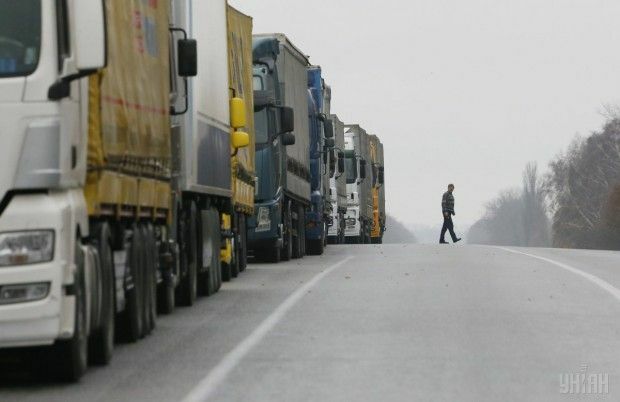 As UNIAN reported earlier, early Friday, February 12, the activists launched an indefinite rally, to prevent the exit from Ukraine toward foreign borders of trucks with Russian registration numbers. The campaign has spread to a number of areas.